In this quickstart we want to add support for interactive user authentication via the OpenID Connect protocol to our IdentityServer. Once that is in place, we will create an MVC application that will use IdentityServer for authentication. All the protocol support needed for OpenID Connect is already built into IdentityServer. You need to provide the necessary UI parts for login, logout, consent and error. While the look & feel as well as the exact workflows will probably always differ in every IdentityServer implementation, we provide an MVC-based sample UI that you can use as a starting point. This UI can be found in the Quickstart UI repo. You can clone or download this repo and drop the controllers, views, models and CSS into your IdentityServer web application. Once you have added the MVC UI, you will also need to enable MVC, both in the DI system and in the pipeline. When you look at Startup.cs you will find comments in the ConfigureServices and Configure method that tell you how to enable MVC. Run the IdentityServer application, you should now see a home page. Spend some time inspecting the controllers and models, the better you understand them, the easier it will be to make future modifications. Most of the code lives in the “Quickstart” folder using a “feature folder” style. If this style doesn’t suit you, feel free to organize the code in any way you want. Next you will add an MVC application to your solution. Use the ASP.NET Core “Web Application” (i.e. MVC) template for that. Don’t configure the “Authentication” settings in the wizard – you will do this manually in this quickstart. Once you’ve created the project, configure the application to run on port 5002. AddAuthentication adds the authentication services to DI. We are using a cookie to locally sign-in the user (via "Cookies" as the DefaultScheme), and we set the DefaultChallengeScheme to "oidc" because when we need the user to login, we will be using the OpenID Connect protocol. We then use AddCookie to add the handler that can process cookies. Finally, AddOpenIdConnect is used to configure the handler that perform the OpenID Connect protocol. The Authority indicates that we are trusting IdentityServer. We then identify this client via the ClientId. SaveTokens is used to persist the tokens from IdentityServer in the cookie (as they will be needed later). The authentication middleware should be added before the MVC in the pipeline. If you now navigate to that controller using the browser, a redirect attempt will be made to IdentityServer - this will result in an error because the MVC client is not registered yet. Similar to OAuth 2.0, OpenID Connect also uses the scopes concept. Again, scopes represent something you want to protect and that clients want to access. In contrast to OAuth, scopes in OIDC don’t represent APIs, but identity data like user id, name or email address. The last step is to add a new configuration entry for the MVC client to IdentityServer. OpenID Connect-based clients are very similar to the OAuth 2.0 clients we added so far. But since the flows in OIDC are always interactive, we need to add some redirect URLs to our configuration. Now finally everything should be in place for the new MVC client. Trigger the authentication handshake by navigating to the protected controller action. You should see a redirect to the login page at IdentityServer. After successful login, the user is presented with the consent screen. Here the user can decide if he wants to release his identity information to the client application. Consent can be turned off on a per client basis using the RequireConsent property on the client configuration. 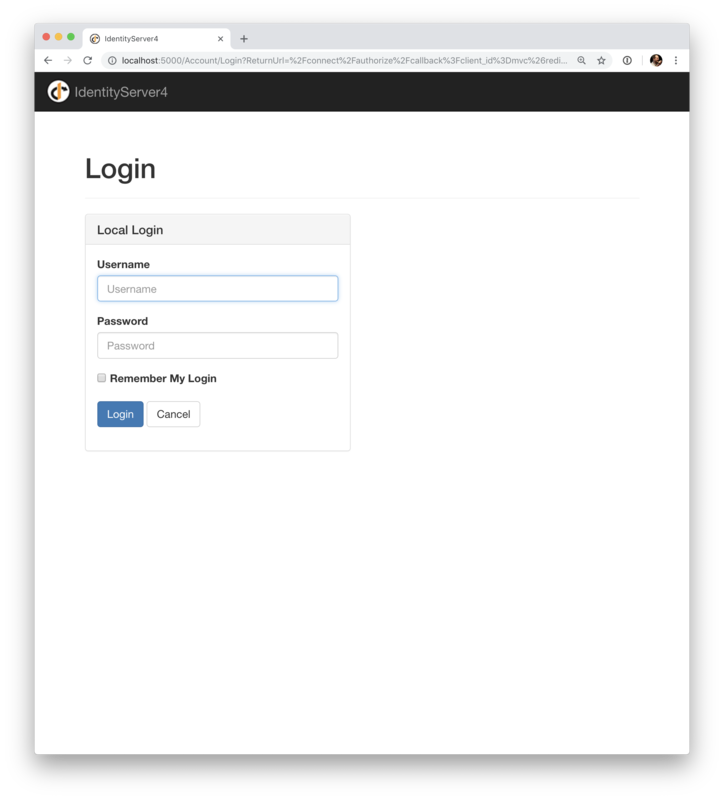 After that, IdentityServer will redirect back to the MVC client, where the OpenID Connect authentication handler processes the response and signs-in the user locally by setting a cookie. Finally the MVC view will show the contents of the cookie. As you can see, the cookie has two parts, the claims of the user, and some metadata. This metadata also contains the original token that was issued by IdentityServer. Feel free to copy this token to jwt.io to inspect its content. The very last step is to add sign-out to the MVC client. With an authentication service like IdentityServer, it is not enough to clear the local application cookies. In addition you also need to make a roundtrip to IdentityServer to clear the central single sign-on session. This will clear the local cookie and then redirect to IdentityServer. IdentityServer will clear its cookies and then give the user a link to return back to the MVC application. As mentioned above, the OpenID Connect handler asks for the profile scope by default. This scope also includes claims like name or website. 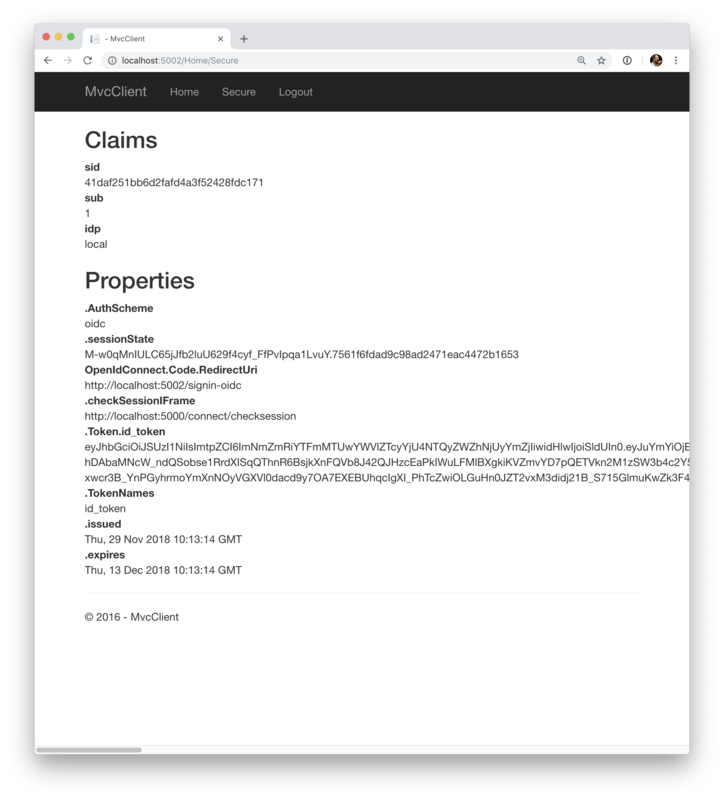 Next time you authenticate, your claims page will now show the additional claims. Feel free to add more claims - and also more scopes. The Scope property on the OpenID Connect middleware is where you configure which scopes will be sent to IdentityServer during authentication. It is also noteworthy, that the retrieval of claims for tokens is an extensibility point - IProfileService. Since we are using AddTestUsers, the TestUserProfileService is used by default. You can inspect the source code here to see how it works.